Dynamics, Transparency, Sound staging, is there anything else! Model # 8.02. I have been searching "audio nirvana" for some time trying countless amps, both SS and tubes. I think I have found it! The little things totally defy any audio logic Ive ever had. Forget about the tubes, the big transformers and the orange juice can caps. They have the ability to grab the voice coils and squeeze them into submission like I never heard before. It dosent matter what you throw at them they simply convey the music like it should be heard. The dynamics are unbelievable. I an not imagine what the newer Reference 9's sound like. Nuforce Ref 8b (version 1.01, peak power: 288W@8ohms, 576W@4ohms, 1152W@2ohms), paired with N803, feeded by Benchmark DAC1 as DAC and Preamp. First thing I noticed is, Nuforce Ref 8b make my speakers able to deliver full mids and bass for the first time. The detail is amazing. Previously I can only hear details with very harsh or bright amps. Nuforce is not any bright at all, but producing much more amazing details! Probably this means the amp is seemlessly powerful through all impendences (3.0 ohms ~ 8 ohms for N803), so all frequencies now are coming out. The seperation and sound stage is amazing to me also, the best I have experienced. The speed is faster than any solid state amps I have heard. I'v also tried other switching amps such as: T-Amp (Sonic Impact T-Amplifier) for about 2 months, and RB 1077 for 20 mins in dealership. they are all very fast, however I feel they are a bit dryer than Nuforce. 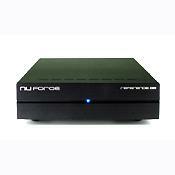 Nuforce is current the only 'analog' switching amp, others are all 'digital' switching amps.